With the stock foam placed on top of the airbox, nobody knows they’re in there. This is one of those ideas that is so simple you wonder why someone didn’t make them years ago. Once again, Thunder Products had developed a simple, yet effective product to improve your snowmobiling experience. Adjustable TPI Valves can fitted in a variety of locations to modify the airflow characteristics of your airbox. Three valves fit quite nicely on top of the SXViper airbox. Snowmobiles are fitted with an airbox on the intake. 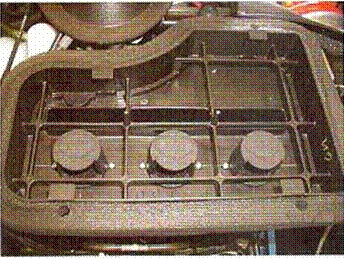 The airbox is quite often restrictive in airflow characteristics, resulting in reduced performance. Many tuners like to “gut” or modify their airboxes in one fashion or another. Usually, this involves removing baffles or drilling holes to allow an increase in airflow by increasing the intake area or removing/altering airflow restrictions. Certain airboxes are well known for their power-robbing characteristics in stock form and are routinely modified. Other airboxes are finely tuned to the stock engine and shouldn’t be messed with, but will see improvements when power-increasing modifications are made that require more airflow and/or change the operating rpm of the engine. Enter adjustable TPI valves. By installing a set of TPI valves into/onto an airbox, the engine is allowed to breathe more easily. More air means more power, as your engine is basically an air pump. The (patent pending) TPI Air Valve is an adjustable intake valve that can be mounted inside or outside of the airbox, allowing you to better control the airflow characteristic. Each valve is 1/5″ tall and fits into a 1/5″ round hole (that you drill into your airbox with a hole saw). Thunder Products recommends one valve per 200cc of engine size. Each valve can be adjusted to flow more or less air simply by twisting the valve control from full closed to full open or anywhere in between. Any number of valves or settings could be used and adjusted to achieve the desired effect. Thunder Products calls this “air jetting”. Riders have known for years they can make more power and compensate for warm air by removing airflow restrictions. Rather then “burn a bridge” with permanent changes or go through time consuming changes, this allows you to quickly and easily make changes to the airbox. The bottom line is the TPI adjustable valve makes experimentation and testing quick and easy, allowing you to run the standard factory air box configuration or increase the airflow. Inside the valve is a foam filter to keep debris, belt dust, or powder snow from entering. A new “Low Boy” valve is also being readied for tighter-fit applications. We installed a set of TPI valves into a 2002 Yamaha SXViper. The stock SXViper is delivered with conservative jetting good for operation down to well below zero, and a triple is far more difficult tot change main jets. Would an increase in airflow like adding a set of TPI valves make a noticeable difference? Absolutely. We removed the intake foam and drilled our 1.5″ holes with a hole saw and installed the TPI valves in a matter of minutes. Dyno testing was performed in an effort to quantify what logic should dictate; That the adjustable TPI valves can alter the amount of intake area and resulting amount of airflow. We made several runs with the valves all the way open compared to all the way shut. We believe this simple test demonstrates typical results an average user could experience in real-world applications. We shouldn’t even need to cite dyno numbers; one look at the valve and most tuners will instantly recognize the potential. A word of caution: as stated, some airboxes are highly-engineered products designed specifically for the stock configuration of your engine. They may or may not flow more air with airbox modifications. The key here is that you don’t have to make permanent changes to your airbox; you now have adjustability. Many sleds with custom combinations of go-fast parts will find these to be incredibly valuable in the quest to find a good working combination. Think of all the mountain sleds that add intake holes to the dash or to the inner shelf of the airbox. Then there are the “cold air intake” kits that allow you to bring in more cold air from outside of the hood. These valves can do it all. The beauty is the ability to quickly return the system to a stock-like configuration with the valves closed. Models that are well known for airflow restrictions are prime candidates, but there will be stock machines that may not respond well to airbox changes. Since this is a new product, it won’t take ling for speed shops to arrive at combinations that enhance their current line of go-fast products. The valves look super-cool and very factory-like. They fit nicely under the intake foam on the SXViper, and make a real difference in performance. Sure, you can still jet the machine AND use the valves for even better performance. Tuners will immediately see the difference and effect of the valves. They sell for only $19.95 each, and the installations are very clean. They’ll be sold through many dealers and distributors, and can also be ordered from Thunder Products at 320-597-2700. Previous post: Your Airbox, Friend or Foe?